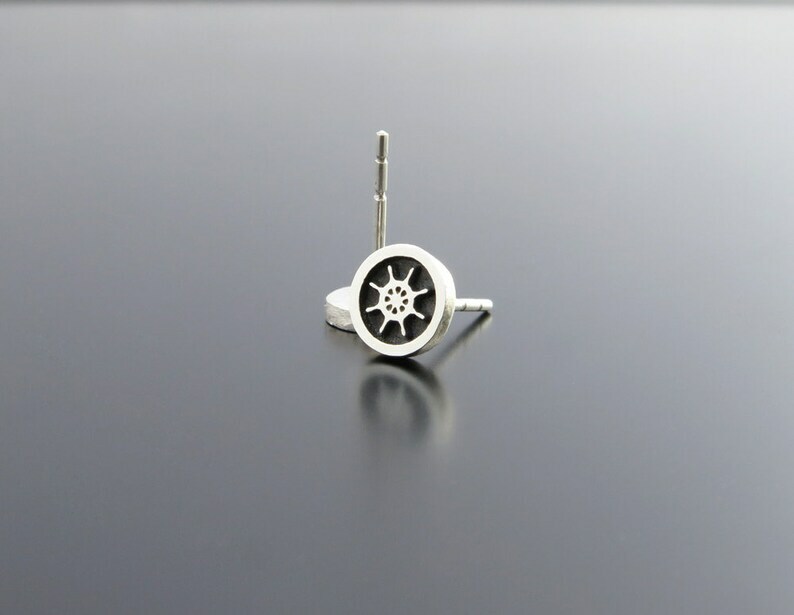 Small sterling silver earring studs with handwheel image, the silver is solid 925. Tiny and special silver earring posts with guitar. Each earring was handmade by myself from silver and was oxidized for completed look. No matter where you go, it's important that you feel inside. You can always "wear" your mood or tell a story through jewelry that is on you. The jewelry has not only an aesthetic role, but also shows to your surroundings your feelings and views. Therefore, we have developed a collection of interesting earrings that can "speak". We call them "spot of mood". 🎁 It is always a special and a meaningful gift for someone you love and understand. 💝 This listing is for pair of studs with handwheel image. Great gift for ship captain. 🌼 Type of earrings: studs, posts. 🌼 The shape is: round. 🌼 The studs are made from solid sterling silver 925 (NOT silver plated). 🌼 The studs are oxidized and polished. ❣If you would like to purchase one stud or two different studs, please contact us by message here. ❣If you have an idea for custom studs for you then you can also contact us anytime. These earrings are my favorite! Just a wonderful and customized necklace ! Thank you so much Dima for your patience, your talent, your communication and your kindness ! I recommend VakadiJewelry to everyone ! Also thank you so much for the earrings as a gift ! I'm so touched and glad. → We accept PayPal or Credit Cards via PayPal. • Your items will be shipped only after the payment is cleared. If you are not satisfied with your items / service for any reason, please contact us with the problem before leaving a feedback. Friendly customer service is our first priority and we'll do our best to solve the problem in reasonable for you way. • All packages are sent via international airmail from Israel. • In some listings shipping is FREE for you :) Worldwide. Any countries.Pay attention! • Delivery takes about 15 BusinessDays (sometimes up to 1 month) depending on your location. Before Christmas it takes more time to receive the item! • We send order to Etsy shipping address and not the PayPal one. • You can change shipping address after purchase if your order has not been shipped already. Please, convo us with the correct address as soon as possible.